Currently based in Brooklyn, New York, Genea Barnes began exhibiting her artful photography in 2005. Her current work has taken her into the streets of over 50 cities where she has photographed hundreds of ghost bikes. When and where did you begin photographing ghost bikes? 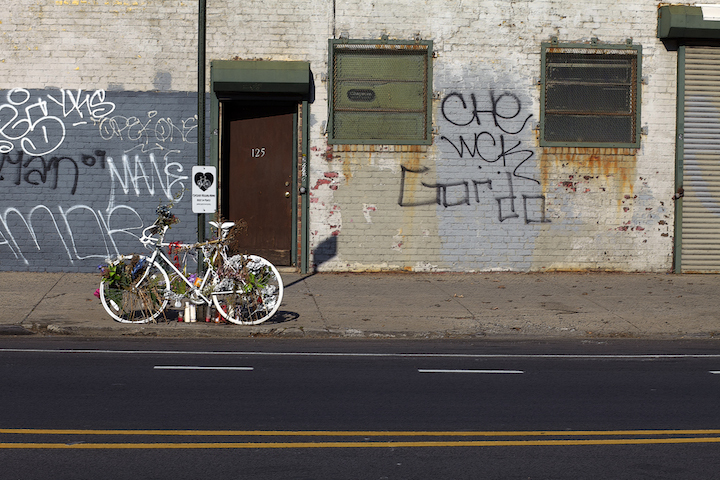 I saw my first ghost bike in Brooklyn in May 2010. It struck me. It felt like someone had punched me in the chest. That was the first ghost bike I photographed. I’ve since traveled to over 50 cities photographing them. Why — do you suppose — you became so committed to this project? I feel a special connection to these bikes. I am taken by their intense beauty. Their impact was — and still is — tremendous on me. They remind us of lives that were lost and they remind us to keep safe. I knew, at once, that I wanted not only to photograph them, but to share my findings with others. Have you any particular message you would like your photos to convey? I am frustrated by people’s lack of spatial awareness. A ghost bike represents the most grievous outcome of this. 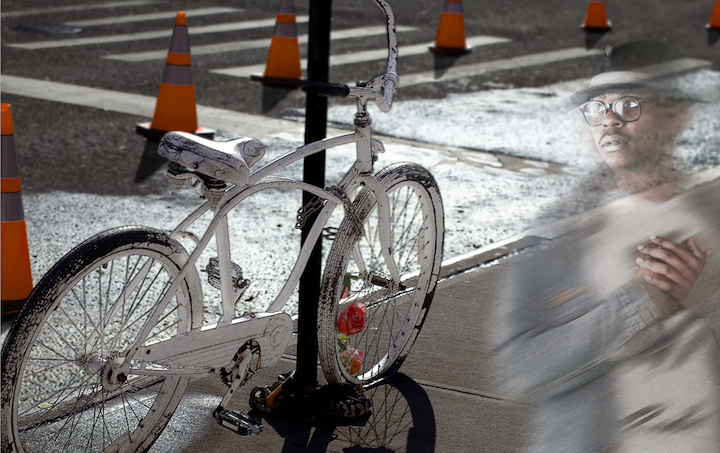 A ghost bike, like much of street art, is a way to call people out. We must all start paying closer attention to our surroundings. I had always hoped that my art would make a difference…that it would raise awareness. 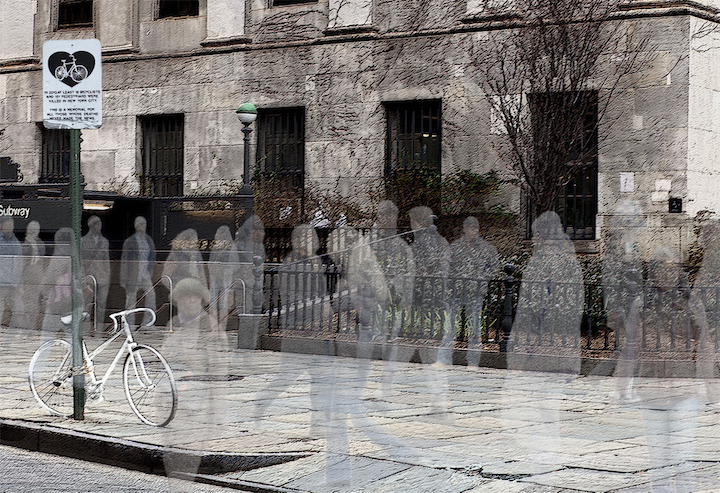 And after my first exhibit of ghost bike images, I knew that it could. Not everyone will attend an exhibit, but anyone can check out a book and, hopefully, be moved by it. We are so distracted by technology that we often forget to pay attention to our surroundings. And the outcome of that can be fatal. You can find out more about Genea’s remarkable photography project here and help fund her book at her Kickstarter here. 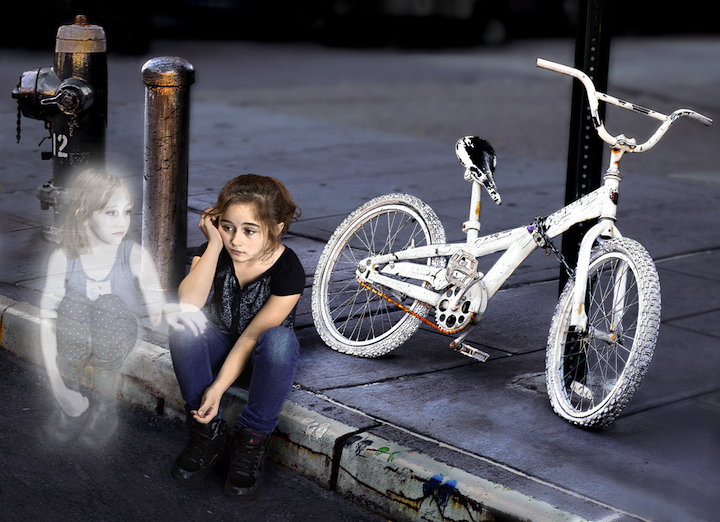 My beautiful, beloved son, my only child, Matthew Brenner, 29, now has a ghost bike on Sands St. at the Manhattan Bridge. He lost his life on 7/7/14. 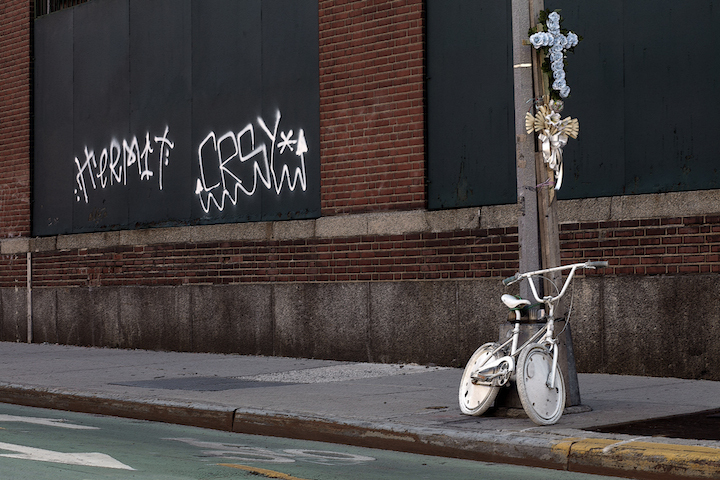 These heavenly bicycles are beautiful, but stark reminders that a person lost his or her life at this hallowed place…be aware of your surroundings, and be safe, for the drivers of these huge, deadly vehicles are often not aware of cyclists in their midst. Nor are they held accountable for killing innocent victims. The loved ones of these departed victims are left with this beautiful, but grievously sad reminder of their past existence. Thank you Ghost Bike Project at GhostBikes.org for these heartbreaking but moving memorials, and thank you Genea Barnes, for your lovely, ethereal photographs. It’s never ending. I just hope to make a difference.